​ ​AUSTIN – A 28,500-sf lease has been signed at a new office building under construction at 901 E. Sixth St.
Car2go NA LLC, the maker of an app that allows users to borrow cars on demand, signed an eight-year lease on the property for about $50 per sf annually. The company has 80 employees in Austin and the new space can accommodate up to 140. 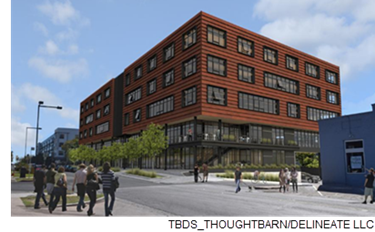 The 130,000-sf 901 E. Sixth St. development will be the first commercial building in Austin to be built with a sustainable construction method using cross-laminated timber. Construction on the project, which includes five levels of underground parking, is expected to wrap up in September 2018. ​​Check out Austin-Round Rock Office Market Research.